Forum Index > Off-topic Talk > A weapon for wedding. Posted: Wed 19 Sep, 2007 3:44 am Post subject: A weapon for wedding. My fiancee forbided me to wear armour that day under the penalty of runnig away from church but she agreed me to have something sharp and pointy and my soldiers from the company to make a lane. The weapon+scabbard must be under 500$,no plastic included,only pinned tangs...Any advice? My wife gave me the 1840 NCO Sword from Windlass http://www.atlantacutlery.com/atlantacutlery/detail.aspx?ID=641 for my wedding present, and though the church forbade weapons in the sactuary, I was allowed to have it at the reception. It is pretty hanging by a chain from the hip, and wonderful to handle, plus, it's got a real tang and cuts like a razor with a little sharpening. I realize it's getting pretty close to a smallsword, which you don't relly like, but I wanted to brag on my wife a little for thinking of such a great present. Thanks! I want a blade for wedding present too! How about the Lutel two-handed saber (Item Number 11006)? Factoring in the shipping it should probably meet your budget. There's also a review of it on this site. I would recommend the Armour Class Mortuary Hilt Sword. As long as you have a baldric already, getting the sharp version comes out at 460 U.S.D. With a baldric the sharp sits at 540. 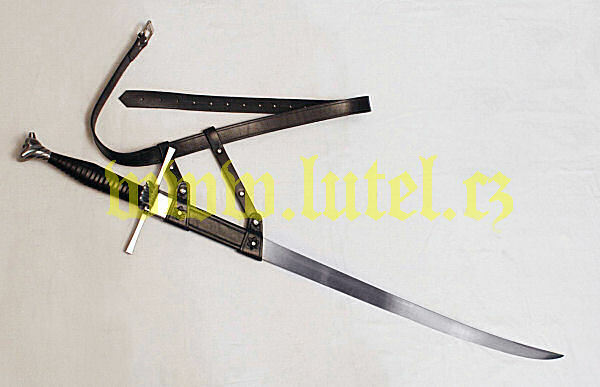 The blunt version, with scabbard and baldric works out to 460. A Messer from Jan Chodkiewicz? Photos of mine in Messer Pictures thread in HATalk. Thaks for the replies.Matthew- stuff made by Armour Class is amazing.I've read official myArmoury.com revievs of two of their pieces.I put that mortuary on my wish list. Yeah, not everyone gets a full harness for their wedding, unfortunately. Indeed, the valiant line looks great. With Christian Fletcher as the designer I have high hopes. Anybody knows something more about this line?Late 2007...hmmmm October isn't late enough? I wish you, your future wife share your passion, like mine does and not stop you with your dreams.